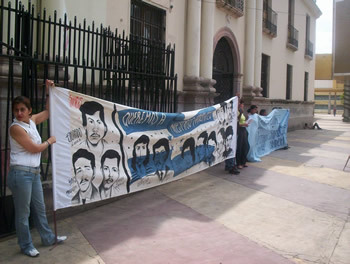 President Daniel Ortega stated on March 10 that Nicaragua reserves the right to reopen its 1980s lawsuit against the United States before the International Court of Justice at The Hague (World Court). The US did not recognize and never complied with the Court's 1986 ruling that it was illegal for the US to mine the harbor at the Port of Corinto and to prosecute the Contra War to overthrow the Sandinista Revolution. The World Court ordered the US to pay reparations, estimated at that time to be US$17 billion. Ortega said that in today's dollars that would be US$58 billion. Ilse Ivania Velázquez Rodriquez, a teacher who was allegedly hit in the head with a projectile tear gas canister fired by police then struck by a vehicle, has died in Hospital Escuela in Tegucigalpa as a result of her injuries. Ilse Ivania was peacefully participating in a protest including representatives of teachers unions, parents of school-aged children, primary, secondary and post-secondary students, popular organizations and members of the National Popular Resistance Front (FNRP). The Honduran Committee of Relatives of the Detained and Disappeared just released this statement that following the violent eviction of teachers from the National Teacher's Pension Institute (Inprema) police and military are pursuing protesters in the street with tear gas and a tank with some kind of orange coloured chemical, which they believe has two functions: to overwhelm protesters with the toxins in the gas and to identify them with the orange colour so that they can be apprehended even after running away. remain unpunished, according to an International Mission that visited the area. 4, 2011 the International Mission found numerous violations of human rights. 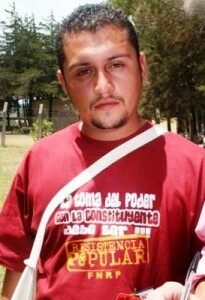 A member of MUCA, Juan Chinchilla was disappeared last night close to Tocoa (see the communique below). Nicaragua Network, Nicaragua News Bulletin: The Washington Post's Christmas Day gift to Nicaragua was to publish an inflammatory and inaccurate editorial accusing the Obama administration of being "Soft on Nicaragua." The editorial invoked favorably Ronald Reagan's war against Nicaragua which cost 40,000 Nicaraguan, mostly civilian, casualties. The editorial accused Nicaragua of "invading" Costa Rica and said that the Obama administration's response was "an invitation to apply for foreign aid." COFADEH calls on the international community to intervene without further delay in matters that were formally national affairs.